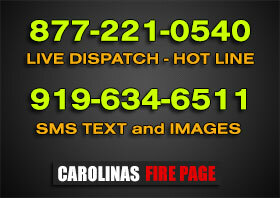 WILKES COUNTY, NC – A large brick home in the Green Acres subdivision of Millers Creek was destroyed and a firefighter suffered a broken wrist in a fire Thursday night. The Millers Creek and Cricket fire departments were dispatched to the home of Bill and Joann Callaway on Faw Street Extension just before 8 p.m. Thursday and found a large fire concentrated on the wooden back porch but entering the attic and floor joists on the ground floor, said Millers Creek Division Chief Robbie Bolin. Bolin said firefighters initially were hampered by having to go to a hydrant about a half mile away near the intersection of Boone Trail and Hensley Eller Road for additional water, but additional fire departments with tankers were dispatched. Joining Millers Creek and Cricket were the Wilkesboro, Wilbar, Mulberry-Fairplains, Boomer and Goshen fire departments. Bolin said the floor joists burned to the point where the ground floor of the house collapsed into the full basement, forcing firefighters to back off for their own safety. The collapse of the ground floor into the basement made it hard for firefighters to reach portions of the fire, he said. “The fire got ahead of us and no matter how many people we had or how much water we put on it, we couldn’t get it,” he said. Around 50 firefighters were on the blaze at the height of the efforts. Bolin said that when a brick exterior wall of the ground floor fell over, a Millers Creek firefighter fell and broke her wrist while moving out of the way. He said two other members of the Millers Creek department were shocked by electricity, but not seriously, while fighting the fire. Bolin noted that a used ladder fire truck recently purchased by the Millers Creek department was used for the first time. Firefighters were on the scene until about 1:30 a.m. Friday and returned later in the morning to spray water on scattered small flames and other smoldering remains. He said Callaway was sitting on the front porch when he discovered the fire in the back porch area after hearing a loud pop and other sounds. The Callaways had just walked back to their house after visiting neighbors. Wilkes Fire Marshal Kevin Bounds is investigating the fire but Bolin said no foul play is suspected. It is believed to have started in the back porch area but Bolin said the cause hasn’t been determined. He said the Callaways have insurance on the house. According to county tax records, the four-bedroom house was built in 1979 and had about 2,700 square feet of living area, plus a 500-square-foot finished basement. The American Red Cross is assisting the couple, Bolin added.